Due to overwhelming feedback from my Facebook friends, here’s my latest and greatest guilt-free dessert. Awesome for the wheat-free, sugar-free, fat-free conscious friends. In class the teacher had a variation on this recipe (ie no Rum), but I just couldn’t help myself. If it’s shaped like a rum ball, and looks like a rum ball, then really, it should have rum in it. She basically added a teaspoon of ground coffee powder instead of the rum/bitter dark chocolate. The core ingredient in this recipe are fresh dates – not dried ones. You can easily get fresh dates in the produce section of the supermarket. They are soft and juicy, and bind all the other ingredients together. The other ingredients in this recipe are mostly nuts and seeds – high in Omega 3 fatty acids and proteins and the sugars are natural sugars (low GI, so they will sustain you for longer). Plus this is so yummy, who can resist (unless you have a nut allergy of course!!!). The best bit is there is no cooking to do. I made a batch in 10 minutes. Perfect. 1/2 teaspoon of rum (I have 80% alcohol volume rum that I bought back from Holland, and it’s so strong you can’t drink it. But it’s perfect for this recipe). 4 teaspoons Chia Seeds (you will find these in the health section of the supermarket). 2 or 3 squares of organic dark chocolate (very high cocoa content is best, and is lower in sugar). Pull the pit out of the dates. Place all of the ingredients into the food processor (except for the coconut) and blend until the nuts are finely chopped and the mixture starts to clump together. Take the mixture out and knead it together to bind. Wash your hands and wet your palms and roll the mix into balls about a heaped teaspoon in size. 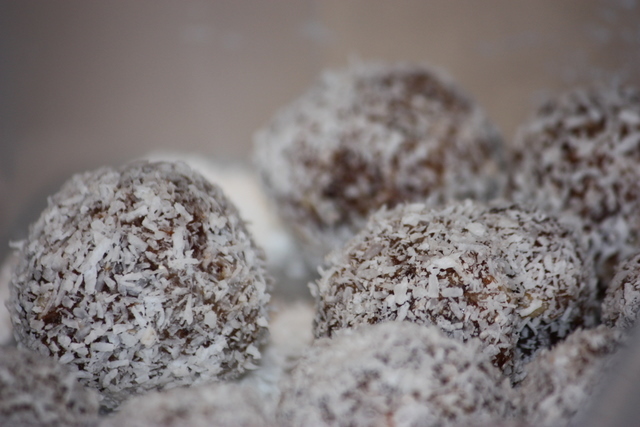 Place on a plate with the coconut and roll them around. Store in an airtight container. Good luck if you can make them last a week!! These look fantastic Geri!!! Inspired me to go and make them again tonight!!! Hey Java Jane – thanks for the comment. And thanks for organising the cooking class at work too. Was cool!